KDE Community Forums – Create a community for your users | Who Says Penguins Can't Fly? It’s always nice to see KDE developers join forum.kde.org, and especially nice when they request a new forum for their application or project. Lately we’ve had two newcomers, Gwenview and Accessibility – the forum team wishes you a warm welcome! Kontact & PIM has also been split from Office & Productivity due to popular demand. In this post I’ll talk about why you, a developer or contributor, should consider to create a forum at the KDE Community Forums for your KDE application or project. Everything KDE-related in one place, users don’t need to register at multiple forums. As if that wasn’t enough, forum.kde.org supports login using KDE identity. One KDE account to rule them all! The board, which runs on phpBB, has many useful features such as guided posting, marking topics as solved, tagging system, advanced search powered by Sphinx etc. Oh, and did I mention that it looks great? We have a very dedicated team consisting of friendly and knowledgeable persons who maintain the forums, help users, moderate posts, make sure the board version is up-to-date and much more. Spam is a real problem for many forums. We have a sophisticated system to deal with spambots, even those who try to disguise themselves as normal users, and an active team that cleans the forum from spam regularly. It’s easy to reach the forum team in case you have any problems or questions (or if you just want to talk to us ;)). To summarize, joining forum.kde.org means less job for you and more benefits for your users. Convinced already? Take a look at our community page for information about how to request a new forum. I’ll repeat this information below, but first, I want to share some success stories. 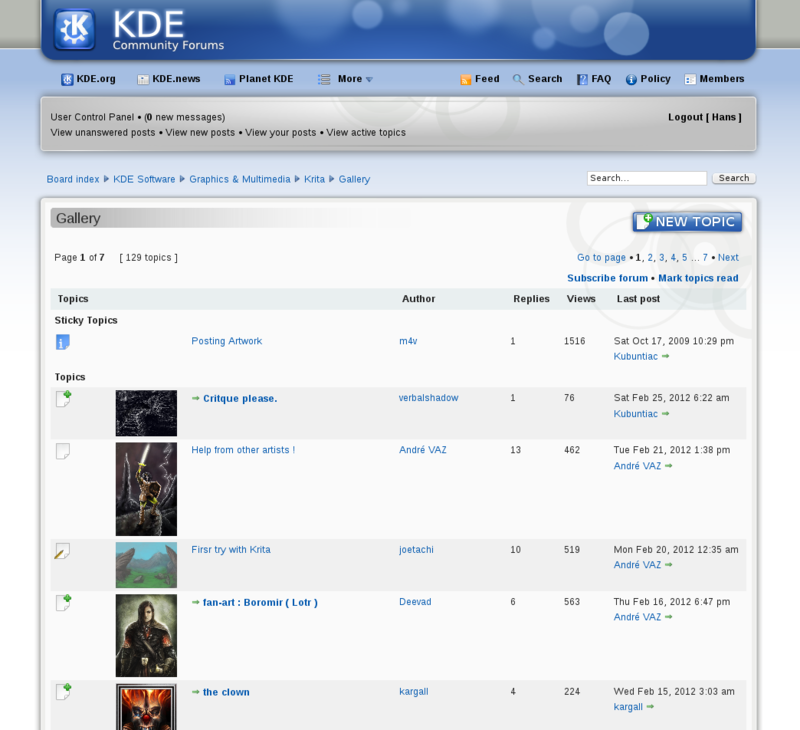 KDE Community Forums already has several forums where developers are actively participating in the discussions and helping users. Some examples that come to mind include Eigen, KMyMoney, KWin, Skrooge and Tellico. There are two forums I want to mention in particular. The Krita forum is a perfect example of an active community. I believe the Krita developers are a big part of the success – they regularly visit the forum, ask for user feedback, let artists contribute in the form of e.g splash screens and are just responsive and friendly in general. There was one feature the Krita guys wanted that the forum didn’t provide out-of-box, a gallery for users to share their artwork. Sure enough, a phpBB mod was soon written by our awesome staff to display thumbnails for topics. I highly recommend that you take a look, there are a lot of impressive work in the gallery, all created with Krita. If you have any special requests for your forum, don’t hesitate to discuss it with the forum team. We can’t promise anything but it’s possible that something can be done. Amarok had an active forum a long time before the official KDE Community Forums was launched. However, the Amarok developers saw the benefits of having everything unified under one roof and decided to migrate their forum to forum.kde.org. This was no easy task, all users had to be moved to the new forum (with possible name collisions) along with the posts. The difference in forum software didn’t exactly help. But still, it could be done. Our competent staff wrote a conversion script that moved user information, posts etc. from one database to the other and the result can be seen at the current Amarok forum. So if you already have a forum and want to migrate to forum.kde.org, ask one of the forum administrators. You can find all information on our new community.kde.org page, I’m just repeating it here for your convenience. Note that your application doesn’t have to be part of the KDE Software Compilation. When in doubt, just ask and we’ll work it out together. I hope to see more developers join the KDE Community Forums and maybe even a few new forums in the near future. If you have any questions, feel free to ask in the comments section below. Wow, we already have two new forums, Marble and KDevelop. This is awesome. Welcome guys! The big thing that makes it possible for the developers to be active on the forums are the rss feed and the irc bot; that means that I get informed about every new post on the krita forum, so I can react. I don’t have the time to check the forums manually for new posts, but having everything new pushed keeps me in the loop and active. Do you think a forum-email gateway would work? We’re currently investigating such an option. Indeed, there’s a section about RSS feeds on the community page, but I plan to write a blog post about it as well. Will probably also add a section about the IRC bot, thanks for the hint!